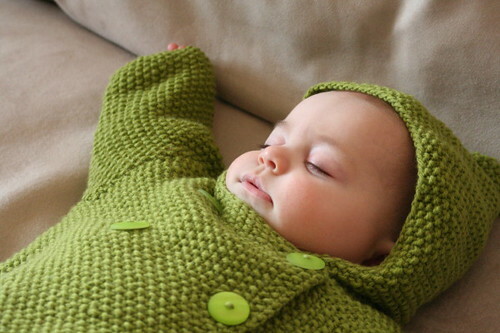 As many of you may remember, when Beatrix was an infant, I knit up this cute little seed stitch hoodie for her. Twice, in fact. 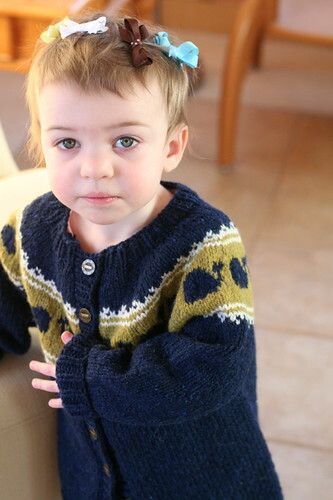 I still maintain that it was the single most useful thing I have ever knit for her. 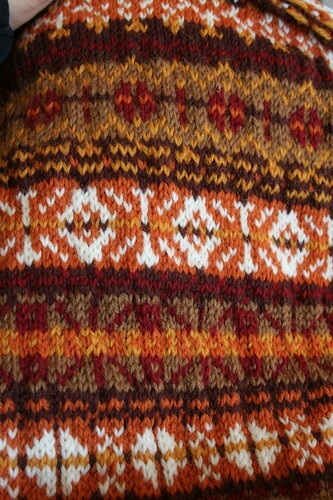 Although the seed stitch seemed endless at the time, the finished product was well worth the trouble. Beatrix hated hats, could not stand to be confined in any way, and was often passed out asleep when it came time to dress her for the cold. 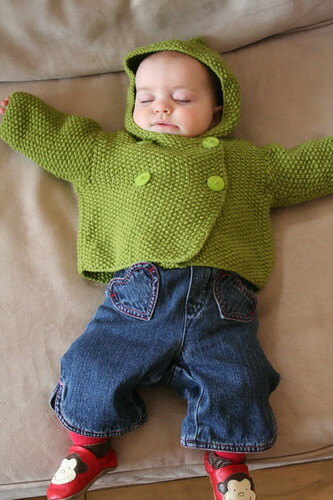 She wore this hooded jacket everywhere because it warm, roomy and easy to get on and off without waking her. 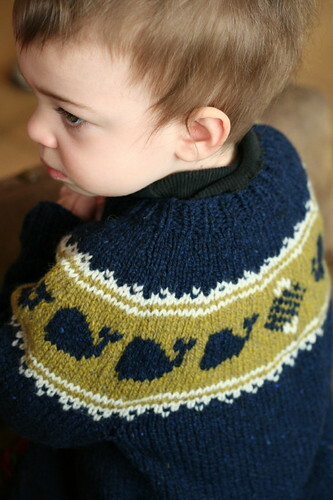 The free pattern has been available on my site for two years. Although it has been consistently twice as popular (in terms of downloads) as anything else I offer, the pattern itself left much to be desired. 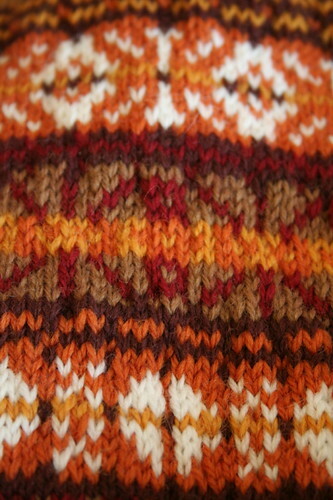 This was one of the first patterns I had ever written and frankly, it was not very good. I did not really want to fix it because if I could do it all over again from scratch, I would have knit the garment completely differently. I have neither the time nor the interest to work out a better, seamless version. Instead, I cleaned up the language, edited out the known errors, altered the neck shaping a bit, and included measurements and stitch counts. The revised pattern may be found here. In my stashbusting efforts this fall, I discovered Brown Sheep Nature Spun Sport comprises the majority of my remnant stash. While not a fancy or exciting yarn, it is a nice, inexpensive wool that comes in a million colors. I heart Nature Spun. 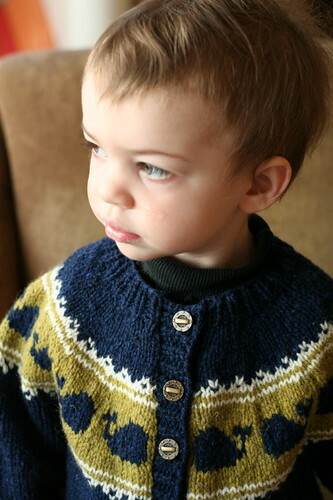 Most recently, I used Nature Spun Sport for Ida’s vest, a DROPS sweater for Beatrix, and my Winter Sunrise hat. 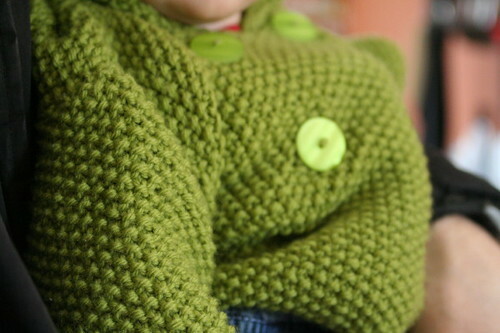 It is also the yarn used in the never ending Katharine Hepburn Cardigan, which I will finish sometime in my lifetime. Excepting the two cones I bought from Whitney’s recent destash, it is worth noting that most of the NS in my remnant stash predates my blog. This means it is at least three years old. I must use it up or throw it out. Period. 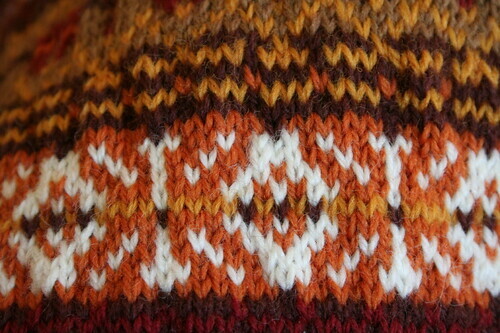 With small amounts of at least 13 colors, I suppose I could knit hats. Many, many, many hats. However, I noticed nearly everything could be grouped into shades of orange/brown or shades of blue. 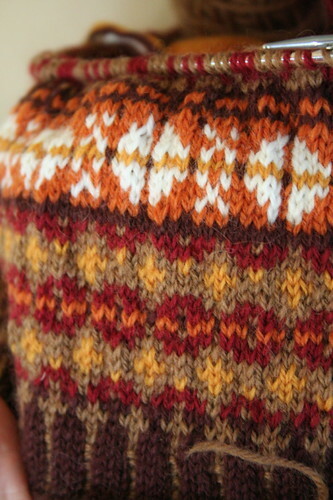 Starting with the former color grouping, I decided to knit up the biggest stashbusting project ever: a fair isle vest like the Ivy League vest I knit last year, using only what I had. I will buy more of one particular color if I run out. However, I will not buy additional colors to use in the project. 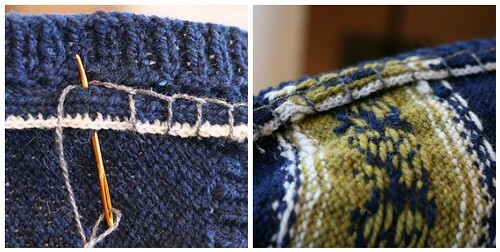 Using the same 3×1 ribbing as Ida’s vest, I cast on last October. The vest grows slowly, in part due to the stitch gauge and in part due to its relegation to secondary project in my knitting basket. Now, several months later, I have reached the V-neck divide. I’m still not sure the bright orange and white peeries jive with the darker peeries. 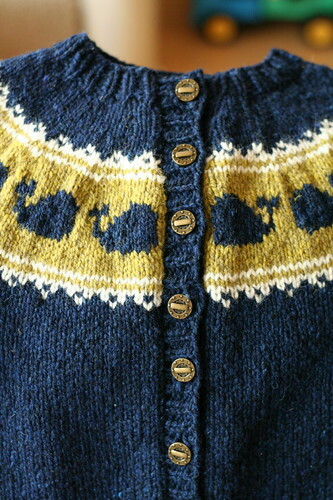 I think they look good from a distance but it’s a little jarring from the knitter’s distance. I added them in the first place because the other peeries blended together into one dark blob. This is my favorite peerie of them all. I intend to use it in other designs, I like it so much. From some angles, it looks like the standard XOXO; but from other angles, I see orange butterflies. Do you? 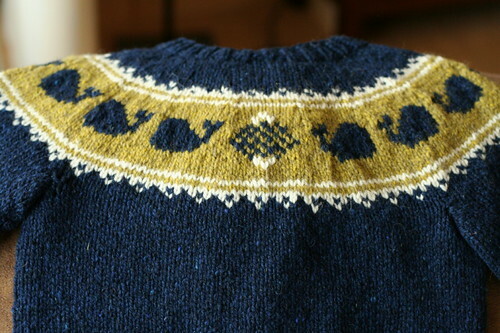 I am willing to accept this may turn out to be the ugliest thing I’ve ever knit. After all, orange and brown are not exactly my favorite colors. However, I think it might be a nice fall vest under a jacket. Furthermore, the planning stages alone taught me valuable lessons about stacking and centering peeries, and stranded knitting in general. I remain hopeful.